It's been quite a few months since I have blogged (JANUARY... EEEEK!!). I'm going to blame it on the weather. My apologies. I've been busy, I promise, just mainly indoors! 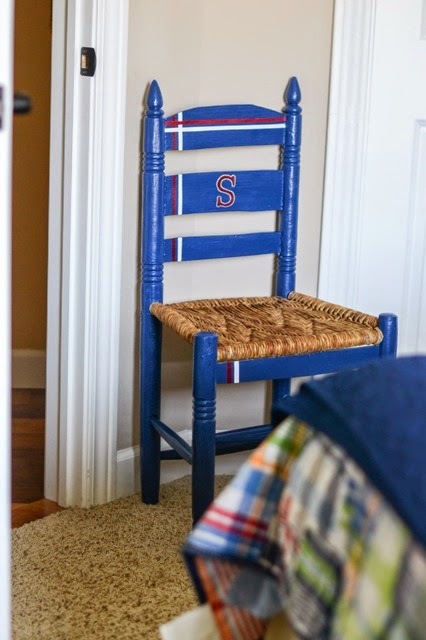 Monogram is so very popular right now and when a close friend of mine asked me to redo a chair for her son's room, I knew monogram would be the perfect idea! As you can see in the before picture, it has a Swedish feel to it. 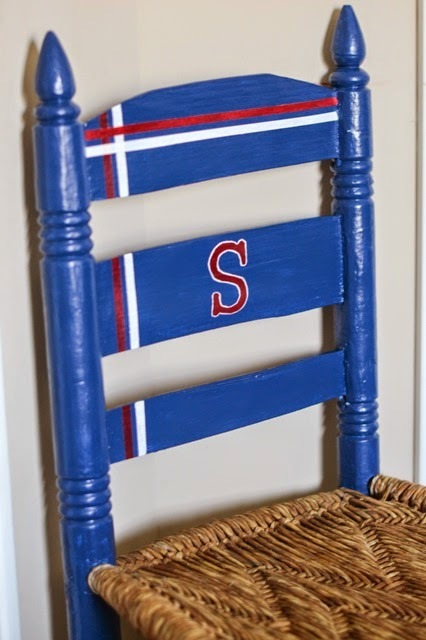 The chair was picked up at an Estate Sale and while very unique and rather old... not the taste of a little boy into dirt and sports! It really does fit perfectly in his room...now!! Here's the DIY I promised!! Step 1: Because this chair was so old and had numerous colors of paint underneath, I had to give it a pretty good sand and prime. 2 coats! 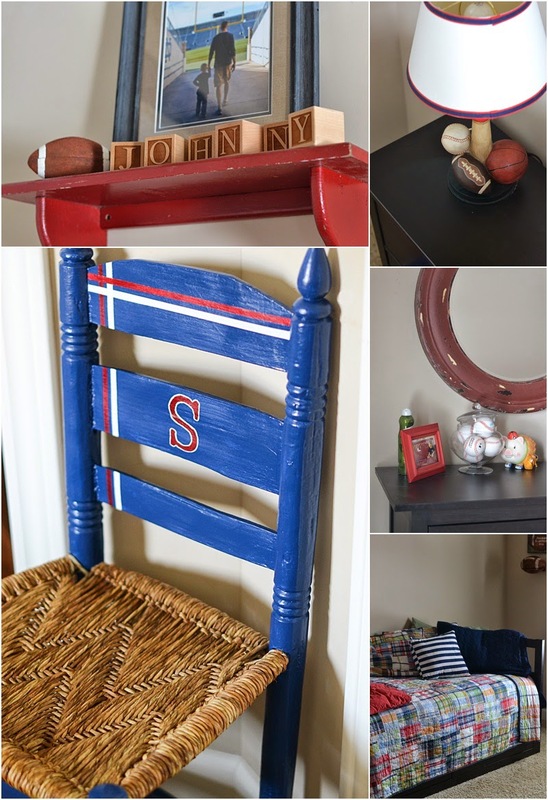 Step 2: I used Glidden's Rich Navy. 2 coats! Step 3: I printed off an "S" from the computer and gathered my other materials (pencil and chalk). Step 4: Cut out your desired letter, turn it over, and rub chalk on the backside. Step 5: Once you have positioned your letter accordingly, take your pencil and trace over the outside of the letter. Voila! Step 6: I wanted some stripes to go along with the J.Crew looking plaid in J's bedspread so I just measured and taped off some stripes with my all time favorite Frog Tape. 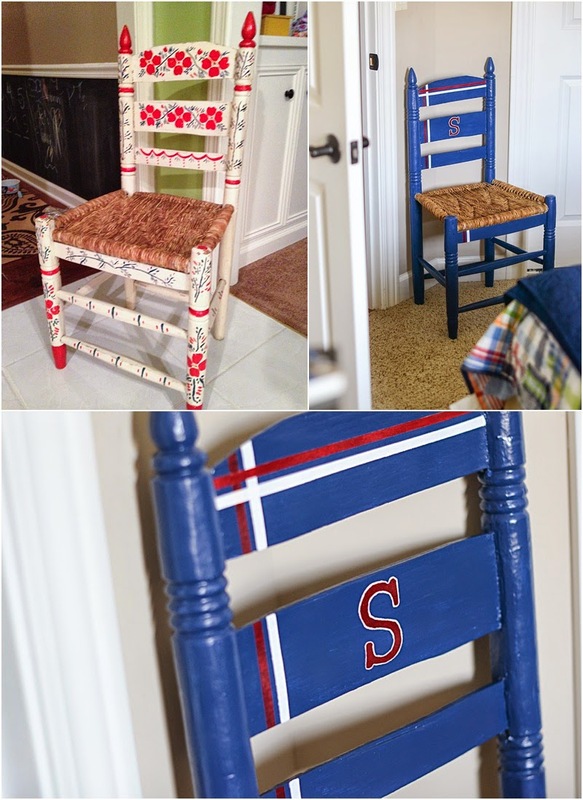 Step 7: Paint on your monogram and stripes. You will need a good 3 coats depending on the color underneath. Because mine was navy I needed quite a few coats of paint. 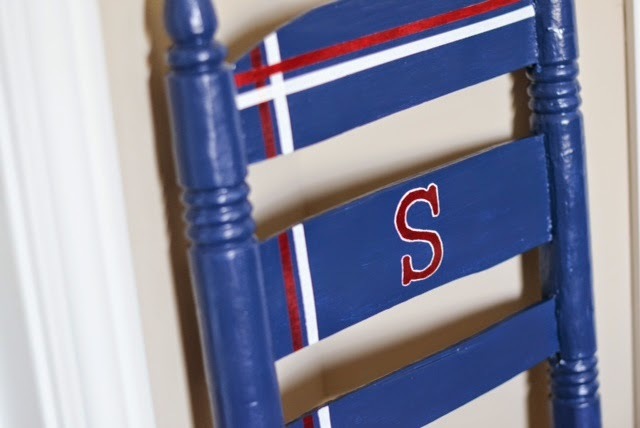 I used acrylic paint for the monogram and stripes. It dries so much faster!! If I can give you one bit of advice... splurge and buy some new paint brushes. It is so worth it!!! I am very happy with the way it turned out. Not gonna lie, I was super nervous to start this project because J's momma is an artist herself. If you are in need of adorable invites, greeting cards, or maybe even a little help in party planning, Meredith Santucci is your lady! Take a minute to check out her website. You will not be disappointed!